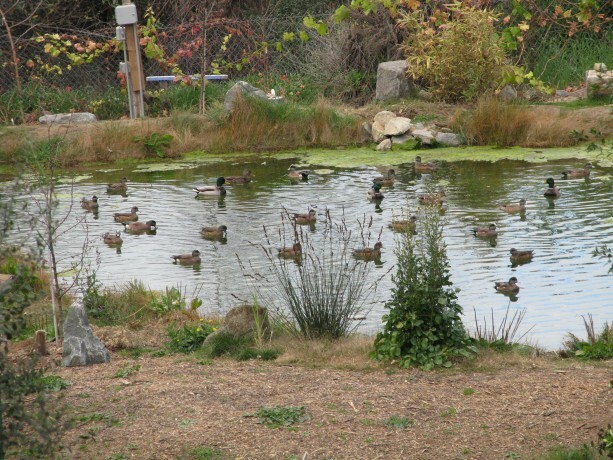 Private tours of Finch Frolic Garden are held by appointment for groups of 5 – 15 people, Thursdays – Mondays. Cost is $15 per person and the tour lasts about two hours. Please reserve and receive directions through dianeckennedy@prodigy.net. Children 5 and under are free; ages 6 – 10 are $5. For school tours, there must be a minimum of five adults. Please, no pets. Photos but no video are allowed. Monthly Open Tours! An Open Tour is for people who don’t have the five-person minimum for a group tour. Open Tours will be held the third Sunday of every month, March through November (unless changed for a holiday or weather). Tours begin promptly at 10 am. All is the same as our private tours; you must RSVP for Open Tours at dianeckennedy@prodigy.net because our tour maximum is 15 people. 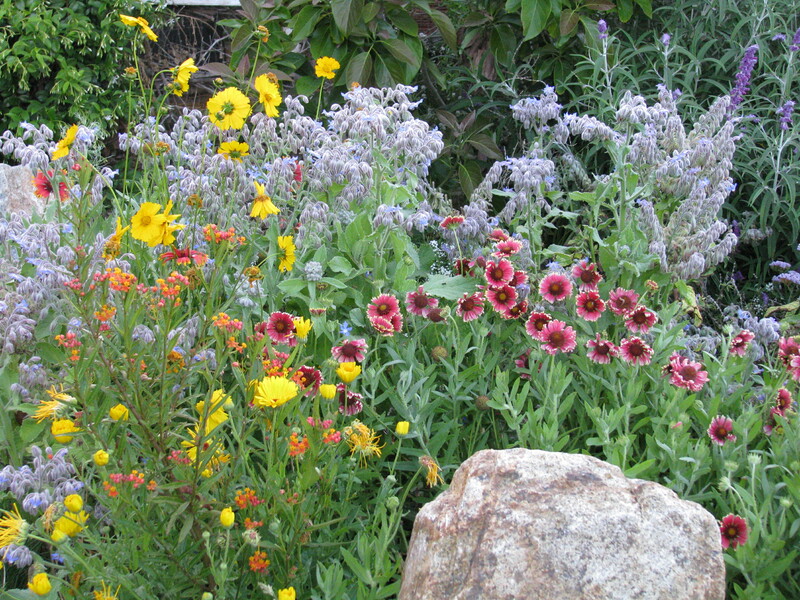 Beautiful flowers, food, medicinal plants and building materials, all thrive in peaceful Finch Frolic Garden. 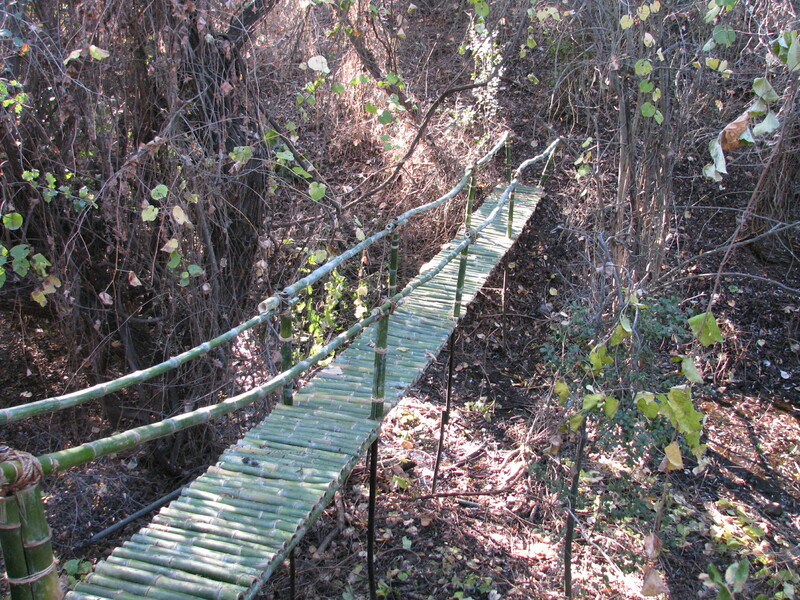 Winding paths bring the visitor through living buildings and bridges made of recycled materials. 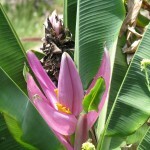 Birds, butterflies and dragonflies are everywhere, as is the heady scent of fragrant plants and blooms. An unlined pond, a cob pizza oven, a compost bathroom, bee hives and chickens are some of the highlights of a Finch Frolic Garden Tour. 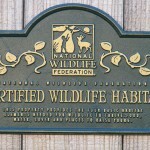 Not one drop of chemical fertilizer, insecticide or herbicide is used on the property, so food and habitat is abundant. Finch Frolic Garden: A Food Forest. 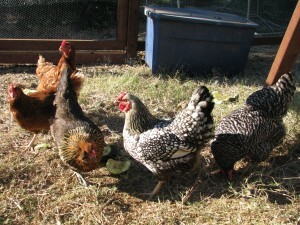 Find out how you can use permaculture techniques on your own property – no matter how large or small – on a Finch Frolic Garden tour. Isn’t it time for you to enjoy your property inexpensively, and stop pouring good money after bad while receiving worse results every year? 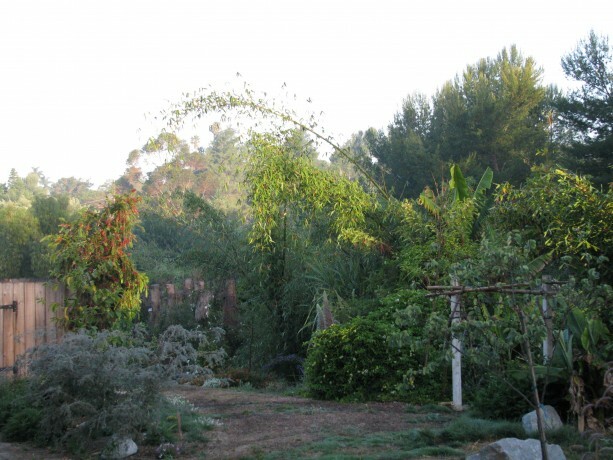 Finch Frolic Garden is a 1.68-acre permaculture based habitat located in Fallbrook, CA. It is privately owned by Diane Kennedy. 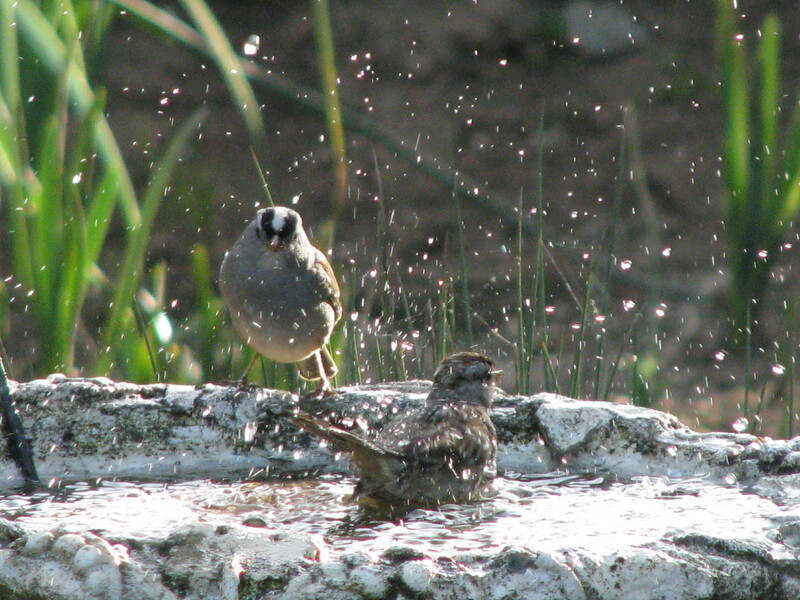 Finch Frolic Garden is not open for general public admission, but can be visited through privately arranged tours. 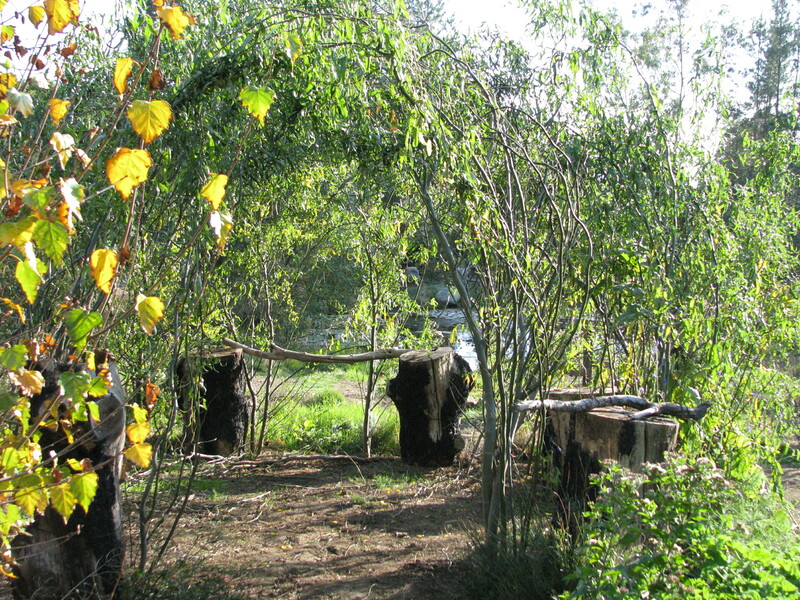 This is an introduction to permaculture with basic landscape designs explained. I show you how to use simple and inexpensive methods to garden, harvest water, grow an abundance of food and ornamentals using materials you probably already have. Tours can be custom designed for your group’s interest. The tour fee is only $15 per person, with group sizes between 5 and 15 (or for smaller groups, a $75 minimum fee). Our tours aren’t just a walk through the garden. 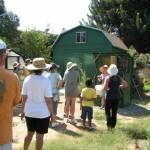 They are a demonstration class of introduction to permaculture and sustainable living. We give you ideas, resources, facts, and answer all your gardening questions. The information can be applied to all gardens of any size, anywhere, and to gardeners of all physical ability and involvement. The Garden is also a wonderful destination for a group outing, such as for plein air artists, photographers and bird watchers. The natural pond attracts migrant and resident birds, animals and insects. 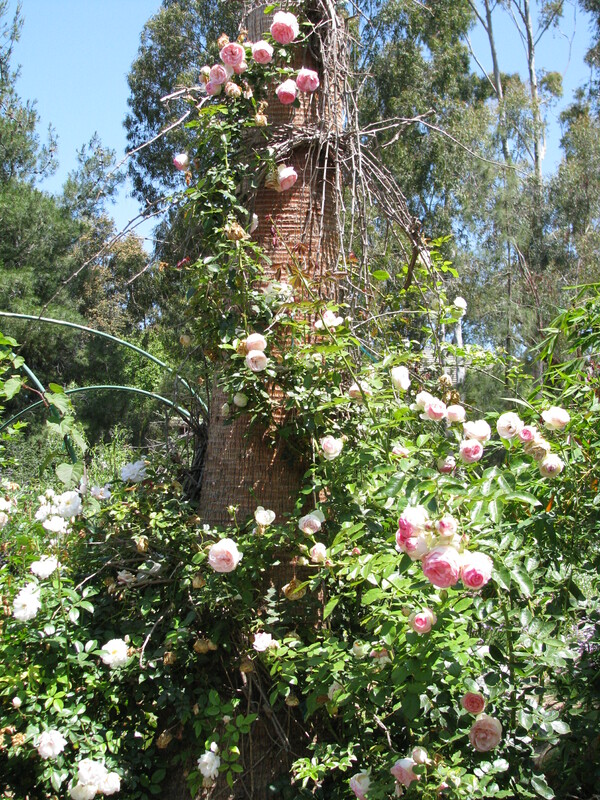 Groups wanting to enjoy the garden for artistic or meditative purposes can arrange a tour followed by free time in the garden, to a total of four hours. A four-hour visit that includes a tour costs $50 per person. Every visitor must sign a hold harmless form. Please contact for more information at dianeckennedy@prodigy.net. A willow or ‘withy’ bird hide: a living building. Scout groups, home schooling groups and school field trips are welcome. Hands-on projects can be arranged for merit badges or course curriculum. Finch Frolic is habitat for everyone. Bamboo structures from building materials grown on site. 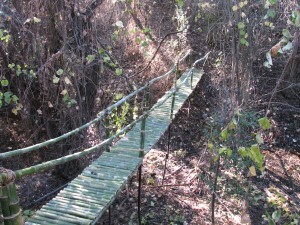 Finch Frolic Gardens is not handicapped accessible, and parts of it has tricky footing. Children are welcome but may not run free. Pets are not permitted. 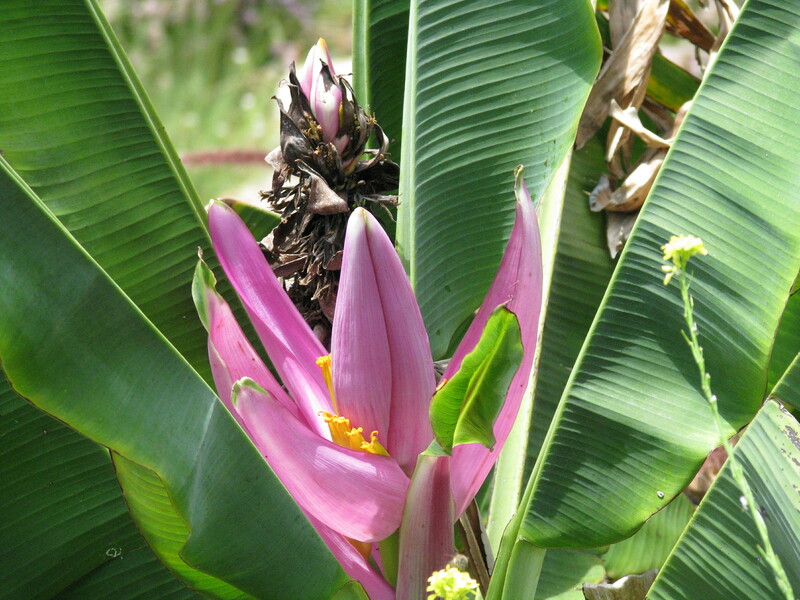 As this is a private residence the plants and food produced are not for picking unless directed by the guide. Limited parking requires that groups carpool with no more than four vehicles. A waiver of liability must be signed by all participants. 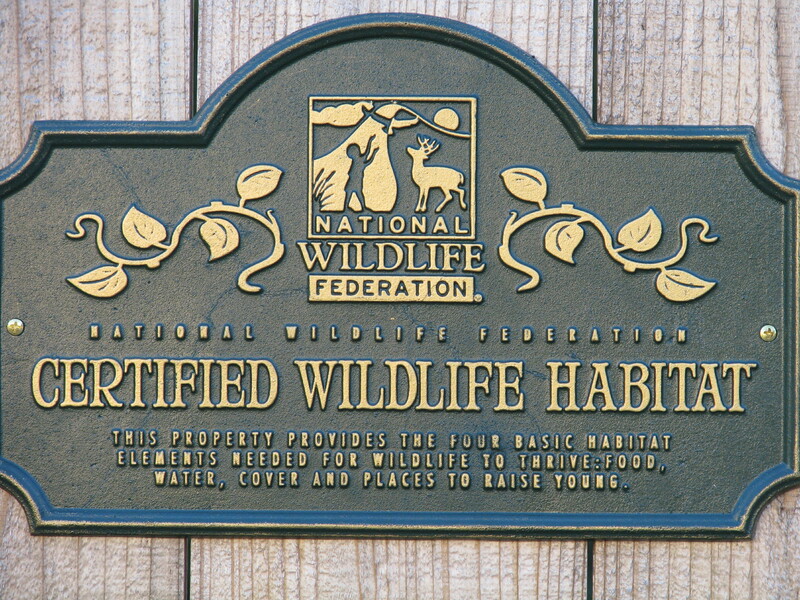 Certified wildlife habitat from the National Wildlife Federation. 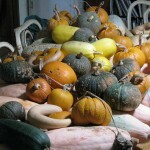 I’m Diane Kennedy, and I’m a permaculturalist with my Permaculture Design Course certification, a blogger, freelance writer, naturalist and vegetarian. I’m a former County of San Diego Senior Park Ranger, San Diego Zoo Safari Park tour guide, middle school librarian and lifelong organic gardener. I have years of experience teaching all ages on a wide variety of topics. Miranda Kennedy has a Bachelor of Science degree from Oregon State University in Wildlife Conservation. 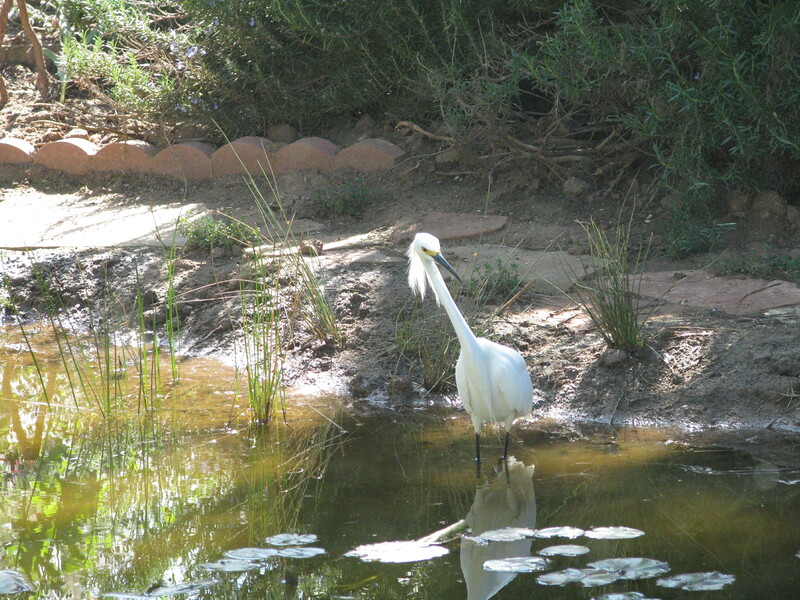 She is on the board of the Fallbrook Land Conservancy and is a bird/insect/plant identifier and speaks on living with wildlife, and other topics. She runs our Finch Frolic Facebook page, where she posts albums of insects and other animals identifying them and their role in the garden. 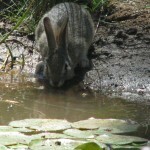 She is available for consultations about wildlife, native plants, native insects, and permaculture. To inquire about visiting Finch Frolic Gardens, or about hiring us for teaching, lecturing, consultation or writing, please email me at dianeckennedy@prodigy.net with FFG Inquiry as the subject. 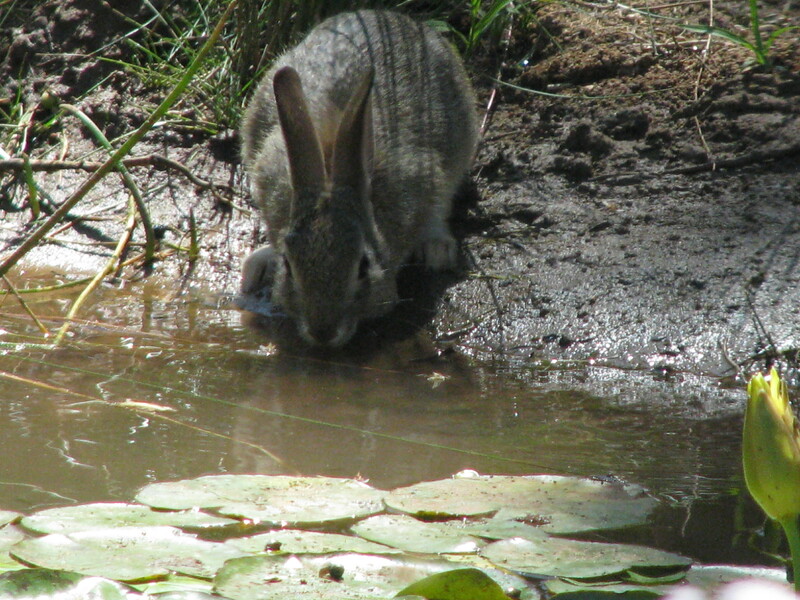 Thank you, and I hope we can help you create a food forest habitat in your own yard. 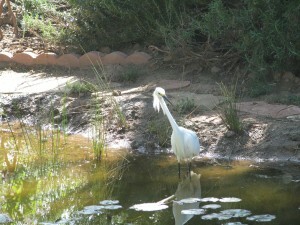 An egret hunts in the pond. 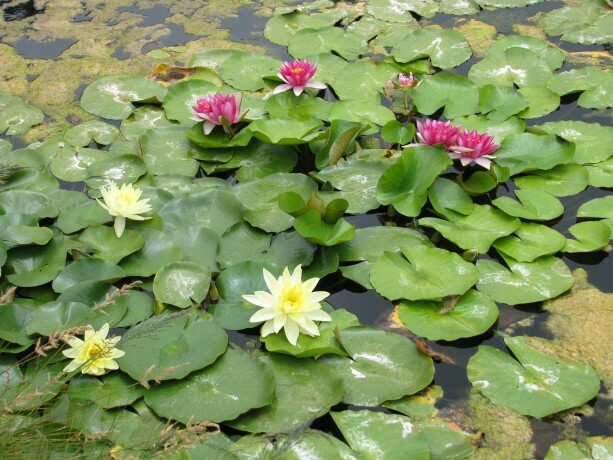 Plants clean the natural ponds. My sister is visiting from Virginia to my home in Oceanside this February. Will you be open? Would appreciate directions to your Gardens. Hi Diane, how are you? Do you girls need any of my oak leaves for mulch or whatever? I’m going to have my guys rake it all up soon and just throw it out. If you come by to get it I want to show you my new neighbor’s Garden. 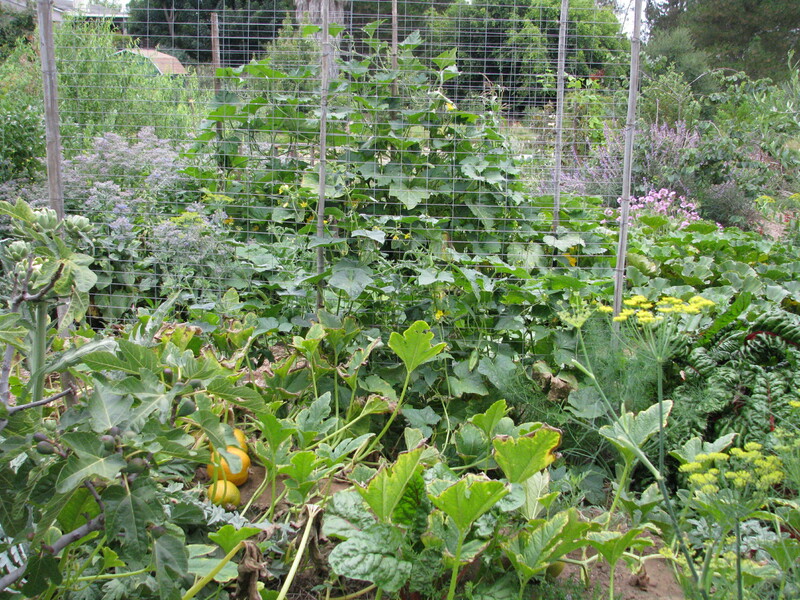 he’s turned about an acre of his land into an amazing Garden. he’s a retired Nursery owner. Please let me know when you girls have another sale I want to get some more of your canned peaches. they were so good! Interested in a tour on April 2. Possible? I’m sure I could bring 5. Out of the goodness of your heart it would please me so if you would send me your/a list of native plants and herbs, shrubs suitable (nitrogen fixing) for us! Please include any and all sources of plants and seeds where we can purchase these. Do you have a spot open for me this month for a tour? Thank you. Is there any problem with dioxin in the cardboard used with the mulching technique you describe in the garden tour? I was on your wonderful tour yesterday. I learned so many good techniques which I want to start using. just RSVP to my email dianeckennedy@prodigy.net if you’d like to be on the Open Tour, or to book a group tour. Thanks! We would love to come & learn more about Peraculture. Thank you. I’ve been assuming all along that l am in the group that’s coming this Sunday, April 19th. I just realized I haven’t RSVP yet. I hope you are counting me in that group or that I am not too late sending my answer. Looking forward to meeting you and seeing your garden! I would be interested in the Monthly Open Tour. If possible, the one on April 19 or if it’s full already, then on May 17. I tried to put a group together with people I know but, couldn’t coordinate dates that worked for all involved. Hope there is some room for me in the next couple of months. If not, I’ll keepe trying! The Gaden seem very beautiful and there is a lot to learn too! I am very interested in visiting Finch Frolic Gardens and would like to know how to register. I’ve signed up for Sunday through Meetup and would like to bring my son who is 22. This is our RSVP. Linda, I’m sorry that I didn’t respond sooner; my blog has suddenly stopped emailing me comments, and I just checked. 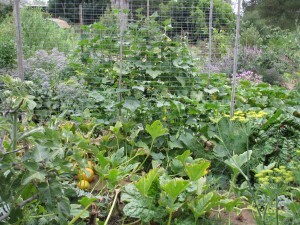 The garden is at its peak vegetable production in July and August, but it is a lush garden all year. We close from Thanksgiving to March 1 due to weather and projects. We are having an Open Tour this Sunday, the 28th, at 10 am, and then not another one until the weekend before Thanksgiving, both Sat. and Sun. at 10. Otherwise we still book tours for groups of 5 – 15. Please email me at dianeckennedy@prodigy.net for other information. Thanks so much for your interest! I’m wondering if you got my question about bringing my hubby during the “best” time of year. I sent it yesterday because I was keeping open the possibility of coming soon. Thank you. Thank you so much for speaking at “Be Ready” last Sat. and inspiring us. I’m trying to figure out how to get my dear husband who generally avoids the outdoors to come and join me on one of your tours. Perhaps it would help to know if the end of the summer ( with the last of crops clinging to vines) or some other time of year may more likely engage him. If you have any thoughts, I’d appreciate it. wow am I just not thinking. I thought that you’d been through twice but saw your message and figured that I missed something. I replied before checking the sign-in sheets, so thanks for emailing me and pursing the request. I’m so happy that you visited and brought others with you; the more people implementing permaculture methods the better! Take care, and thanks again. I’m so sorry that I didn’t reply: apparently WordPress has decided not to send comment to my email without notifying me, so I didn’t know. I truly apologize. We are having more open tours this month, and I have them posted on the events page of the blog, but for a group of 5 or more I do tours by appointment most days. Please email me if you are still interested at dianeckennedy@prodigy.net. Again, I very much apologize! Hi Diane, I’d like to come back for another tour on August 24 with my husband and 2 friends. Can you let me know if that is possible. Thank you! Will you be having any workshops or events in the coming months? You have created the conditions for a joyful sustainable place to arise and unfold naturally. Hello. 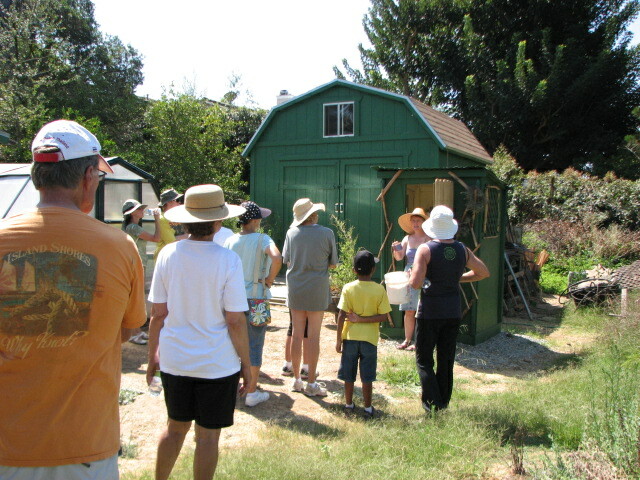 My wife and I have been researching and enjoying learning about permaculture for months now and moved to temecula from o.c a year ago. We have a bigger back yard now which brings us one step closer to making our permaculture garden a reality. We would love to take a tour if it’s possible for just the two of us and our new daughter. I am interested in a consultation. Please contact me. Thank you for contacting me! Any relative of Judy’s has to be wonderful. Unfortunately Finch Frolic is closed until March 1 as my daughter and I work on some large projects. We’ll begin tours again when the spring blooms have begun. I’ll keep updating the Finch Frolic tab on the website. I’m glad that you like the tomato jam. We’re sold out of both kinds, and won’t be able to make more until summer when it is tomato season. I hope to meet you and your husband in the spring. We will be in your area today through Monday and would like to visit. We don’t really need a tour, but would like to wander. My husband is an artist, and I like to play. We heard about you from our niece, Judy Egan. I am the aunt you graciously shared the green tomato recipe with during the holidays. As promised, I would also like to buy some from you this weekend!